Like that album art to the left. Sans text, that’s the cover of Streetlight Manifesto’s fifth album The Hands That Thieve. You should really just ignore the text on that image completely. 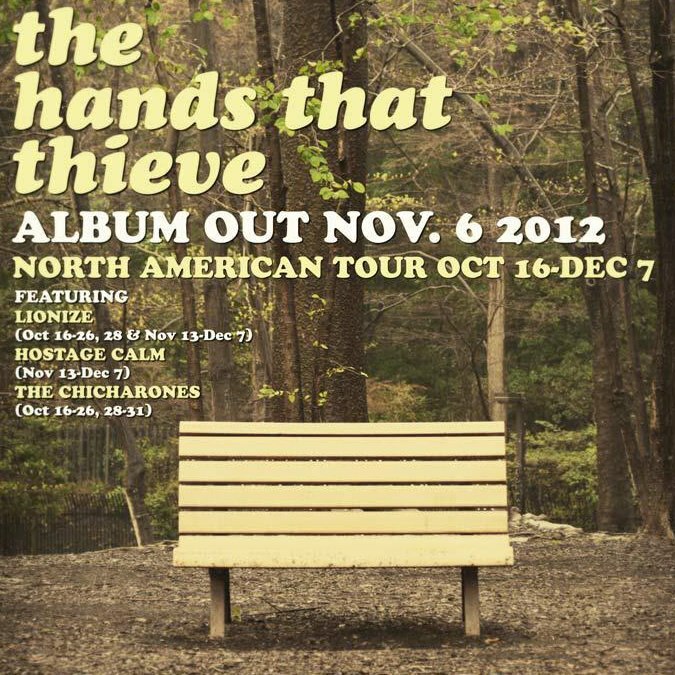 The Hands That Thieve didn’t come out on November 6. It didn’t come out in 2012. It hasn’t been released yet, period. After enough behind-the-scenes melodrama to keep a soap opera scripted for a few years, we finally got confirmation that we will be announcing the release date of our long delayed record “The Hands That Thieve” this Friday. We are all beyond excited that we can finally see the end of the tunnel, and you’ll all be able to hear the hard work that has gone into this record. Once again, we profusely apologize for the wait, and are eager to hit the road in the near future to support the new tunes. If you haven’t already pre-ordered the album, you still have the opportunity to do so up until the actual release date. All pre-orders made through the RISC Store, will come with a free gift from us, a live EP CD, recorded during the last US tour. Exciting! The band must’ve felt rather confident about this; they re-posted the same message to their Tumblr a bit later. With a few days to salivate on a highly anticipated, highly delayed release, fans waited till the end of the week when the announcement would come. Except the announcement never came. So what’s the deal guys? Is the album done? Do you have, like, some samples to clear or something? Or maybe it has something to do with the band’s label, Victory Records. To keep you extremely up-to-date, we and Victory (and our respective lawyers) are working hard to hammer out a release date ASAP Hang tight. Oh fun, lawyers. Always a great sign. Check the date too. Friday, February 1, posted around 5 pm EST. As of press time we haven’t heard or seen any more details. Except on Wikipedia. Let’s hope we can’t count on it as a trusted source this time around. ive been waiting… so long… this fued between streetlight and victory seems to go On & On & On.